Bracknell, UK. 29 September 2016 – Computer Products Solutions, a division of Panasonic System Communications Europe (PSCEU) (“Panasonic”), and FusionPipe Software Solutions Inc. (“FusionPipe”), a Vancouver-based developer of authentication & data security solutions for enterprises, today announced a new partnership through which Panasonic will sell and support FusionPipe’s patented QuikID™ authentication solutions to its European customers, resellers and distributors. 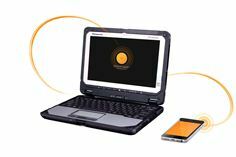 QuikID™ is patented software, engineered to improve end-user authentication (lock/unlock) for ruggedised PC’s, laptops, tablets and VPN networks. It eliminates the need for username / password combinations, tokens, smartcards, OTPs (one-time passwords) or USB’s, offering a superior user experience while increasing work force productivity without compromising data and network security. Fusionpipe is one of the latest Independent Software Vendors (ISV’s) to become officially certified and approved for use with Toughbook or Toughpad devices, under Panasonic’s new Certified ISV Programme. Panasonic will sell FusionPipe’s QuikID™ software as part of its ProServices range of offerings within its existing line of distribution channels across the European Economic Area, Switzerland and Turkey .